¶ The job looked so easy. Three, four bolts and that part will come right off...30 seconds to do it... Max. Two hours of frustrating work later, it's still in there...WHAT DO I DO NOW? It's happened to all of us, at one time or the other. Those lousy JIS Phillips Head screws seems to strip out so easy. 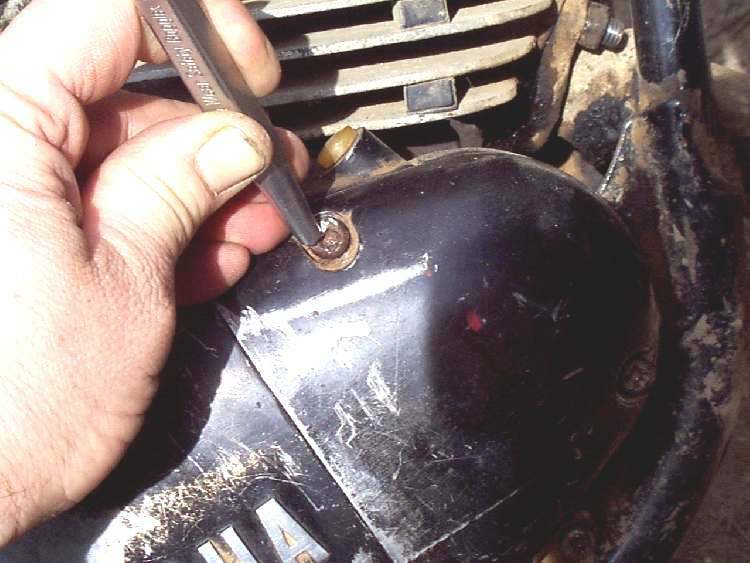 First, make sure the grooves in the screw head are in good condition. Also, make sure the Phillips Screw driver or Impact Driver bit is the right size. If you don't have an Impact Driver you can try a trick my friend Devan suggests. Pound on the bolts with a hammer before trying to remove them. You will need a strong screw driver to do this but it really does work... at least some of the time. 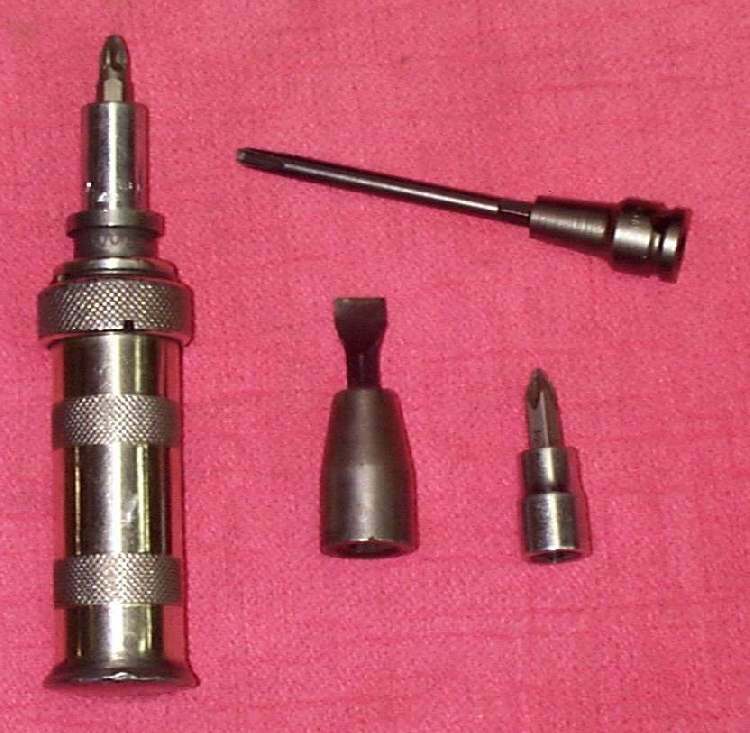 If the screw head is a bit messed up you can put some fine aluminum carbide paste, similer to valve grinding paste on it to help the tool hold to the screw. Penetrating oil won't hurt, but I usually only use it on nuts or on screws that I feel will be a problem. 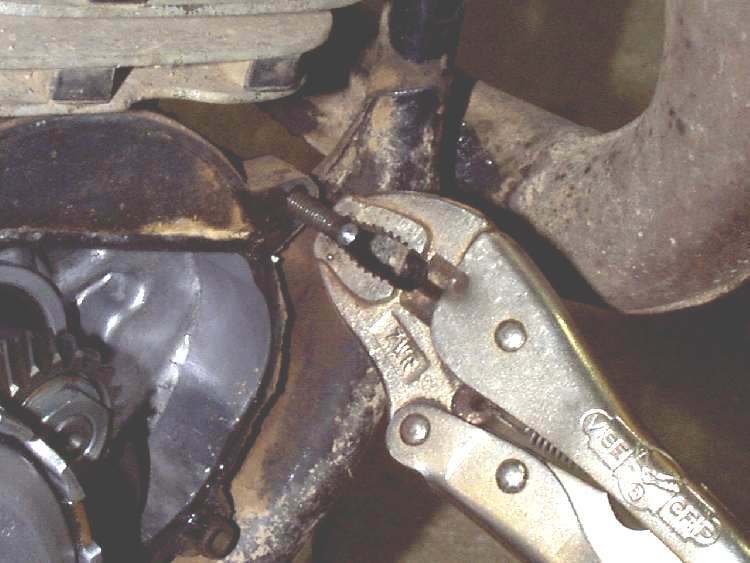 On most crankcase screws, the head is a long way from the threads. Soooo... you give that Impact Driver a good swat and the screw head strips completely out. OK, OK...go get a small, sharp flat steel chisel and a steel punch. Using either one or maybe both. Gouge and punch into the screw head. Do this off center and in the right direction (counter-clockwise). If all goes well, the screw will loosen. If not, you will have to drill out the Screw. Pick a drill of about the same diameter as the SHAFT of the stuck screw, NOT the head. Now, get a drill and drill it out. Go in just far enough to break the head off the shaft. 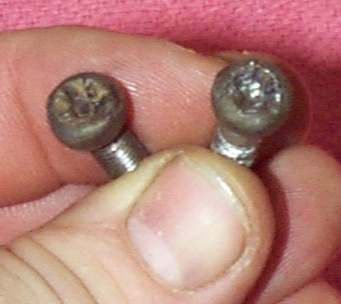 Do this with each screw head that is rounded out and remove the cover or whatever part the screw is holding on. Now you will see the shaft of the screw sticking out. Grasp it with a vicegrip plyer and unscrew it. About 80 % of the time it will come out very easily, sometimes even with your fingers. OK, but what if it doesn't? Ah yes, the other 20 %. There are several options, none of which are easy or fun. Soak the shaft in some kind of penetrating oil for awhile, overnight maybe, then try the Vice-Grip again. Don't go crazy with the Vice-Grip. You don't want to twist it off, and rust can really lock things in. 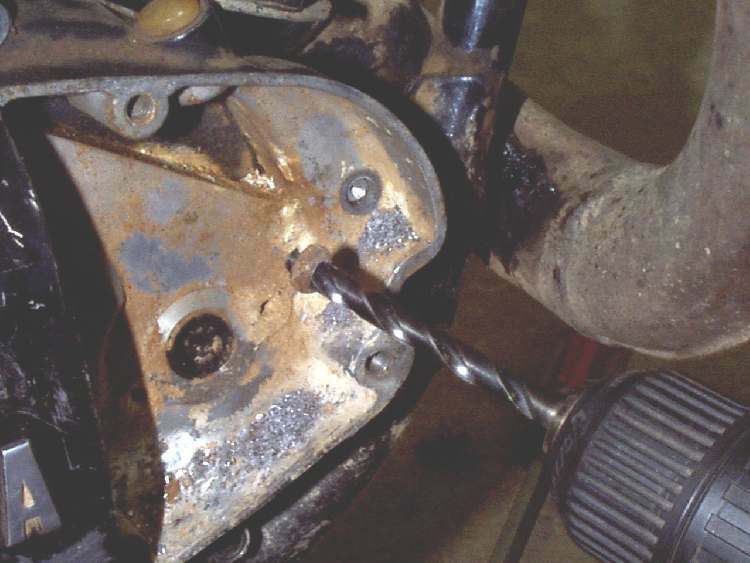 How tight can rust lock something up? Well, I had a friend who worked at a big shop that had a 20 Ton press with a guage on it giving the pressure. 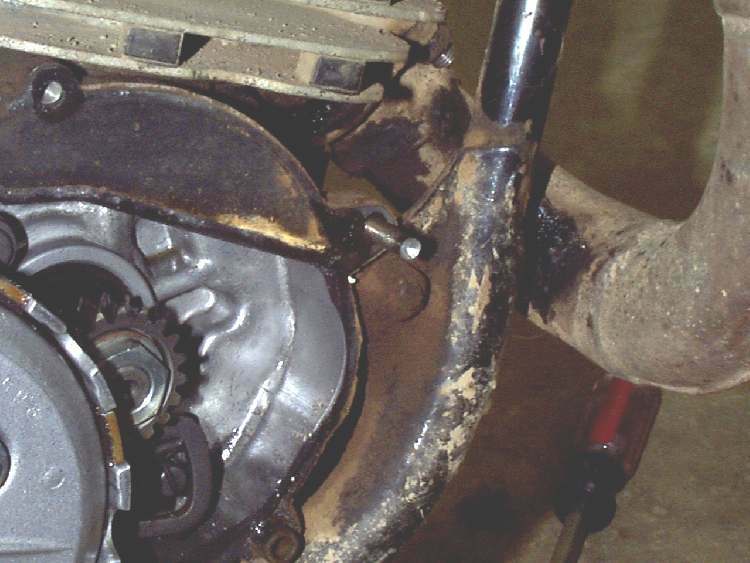 He tried to press an axle out of a Troy-Built rototiller wheel. He gave it the full 20 Tons... It never did come out. The only thing holding it to the wheel was rust. I have had similar things happen to me. How did he get it off? Cut it off with a torch and replaced the wheel and axle. Hey, he's not the one that let it rust... and he's not the one who had to pay for it, either. The customer paid for it. Lack of maintinance does have it's price. Heat up the area around the bolt a bit with a propane torch. Just do it a bit...we are looking for about 212 degrees or so. Don't get carried away. Now try the Vice-Grip. You can heat things up REALLY HOT, like cherry red with a Torch then let it cool or even help it cool with a bit of ice. Watch out when you do it. Wear gloves and eye/face protection. Also, if it is a steel part in aluminum, don't melt the aluminum. Heat and cool and oil the part over and over again. Worry it. If the part is expensive or "...you just can't get them anymore. " TAKE YOUR TIME ... WORRY IT. 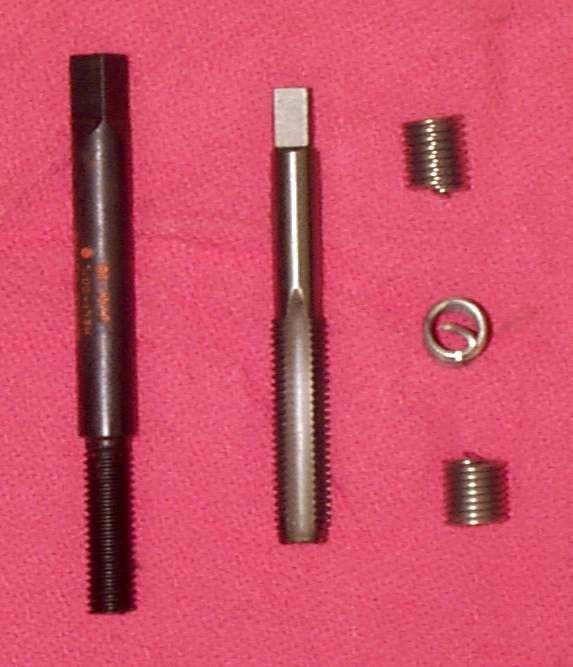 If the shaft is really in there and will not come out or if it broke off level with the case , take a center punch and put a deep punch right in the center of the screw shaft. That is to help start a drill. Now drill a small hole down into the shaft. Start pretty small and then go to the next size larger drill. As soon as you have a big enough hole try to use an easy-out type of tool on it. Turn the tool gently. If you get carried away and break off the easy-out in the hole you will NEVER get it out. Easy-outs are made of very hard metal and you cannot drill them out. I suppose you could heat them red hot and take the temper out of them, use a bolt disintegrator, or Aluminum Sulfate, but... just don't break them, OK? If it still will not come out you will have to keep drilling, going up one step (or size) at a time until you hit the threads. Then get in there with a needle and kinda peel the threads of the screw out from the threads of the case. I know that sounds kinda weird, but I've done it many times. If your starting punch hole is off center it will make things harder but it can still be done. If you've really buggered up the case threads, as will sometimes happen, you can put in new threads called Helicoils. They are, however, somewhat expensive. You can get drills that are left handed. You then drill into the metal with the electric drill set in reverse. This can be handy. Sometimes, as you go up in drill sizes, you reach the magic spolt when the pressure keeping the stuck shaft stuck dissapears. The shaft will unscrew and come off on the end of the drill. Neat. OK, that covers screws... How about bolts? You can use most everything we talked about with screws plus a few things more. Use a 6-point socket. They are much stronger then the 12-point and they grip the hex head better. If the head is totally rounded off get the next size smaller socket and a hammer. 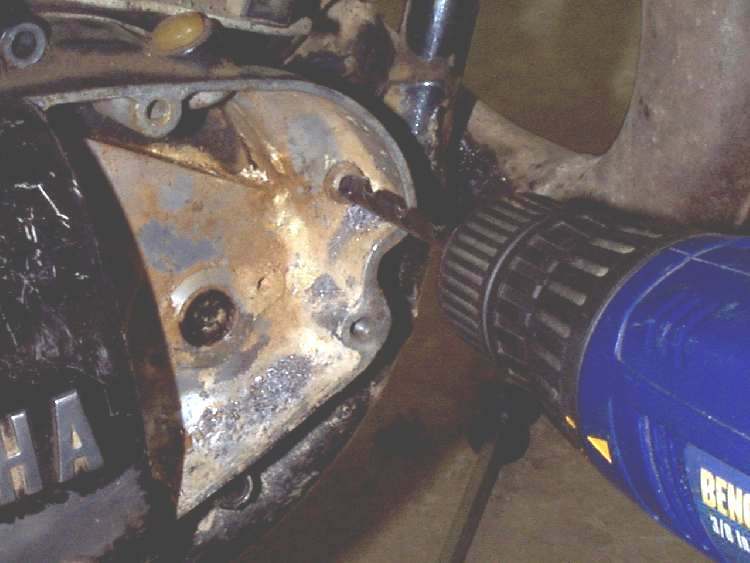 After making sure that whatever part that is under the rounded off bolt head is strong to take the pounding, BEAT the socket onto the bolt with the hammer. Gross... but it works. It helps to use a " guaranteed forever " type socket too. You can hacksaw the nut till it is almost through, then heat it up red hot and touch it with a piece of ice. That will crack it the rest of the way through. If you break off a tap in some kind of non-ferrous metal, like an aluminum crankcase, you can try soaking it in a solution of Sulfuric Acid. See the Acid Page. Now, if you have a bolt or screw that broke off in a real expensive part, there is one last option... a metal Disintegration Machine. They cost a lot of money to own, so not very many places have one, but if you find a place that does have one, it doesn't cost to much to disintegrate a bolt. You will just have to call around. Lots of times they can do it right on the bike.